Well Summer has definitely made her way around and seems to be settled in for the season. With temperatures above a hundred we are beginning to wilt around here. Welcome July. 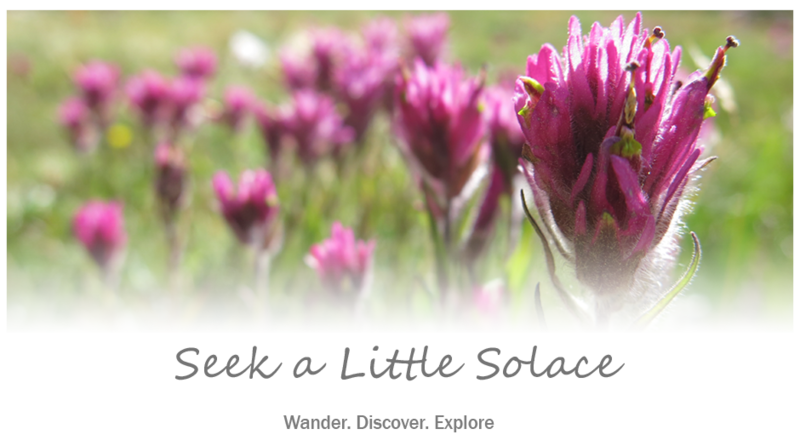 There are many things I love about my summer season, but the heat is not one of them. I don’t know about you, but when the mercury rises, my appetite drops. I don’t desire much but sweet summer fruits, simple salads, smoothies and such. So, here are a few suggestions for healthy and refreshing ways to keep your cool in the midst of this summer heat. I think I have mentioned before how much I adore my early morning coffee hour. Now, a follower of truly healthy ways would know to nix the morning caffeine in favor of purifying lemon water or detoxifying juiced greens, but I am still quite attached to some of my flawed ways. I don’t drink much in the way of caffeinated beverages anymore, but my favorite brew, in my favorite mug, in that quiet hour just before dawn…I am just not ready to give it up. However, even those early morning hours have been too warm lately to really enjoy my morning brew. So, I have been looking for some sort of cool, yet comforting, alternative for my favorite morning mug. This cold Chai Spice smoothie might be just the thing. My hubby makes this often and he quite enjoys it. 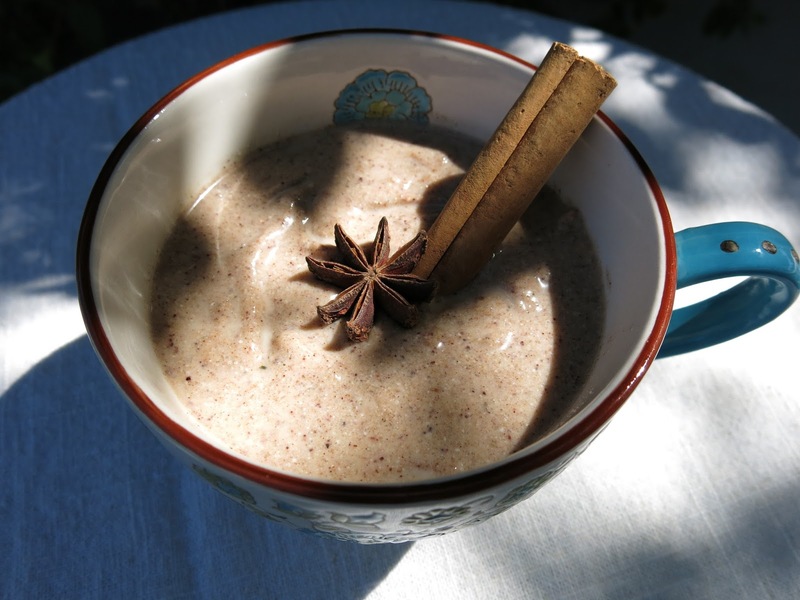 With a perfect combination of warm chai spices, the cool creaminess of frozen bananas and a little energizing zing from maca and cacao, this is a great caffeine-free (and cold!) alternative to your hot morning coffee or tea. 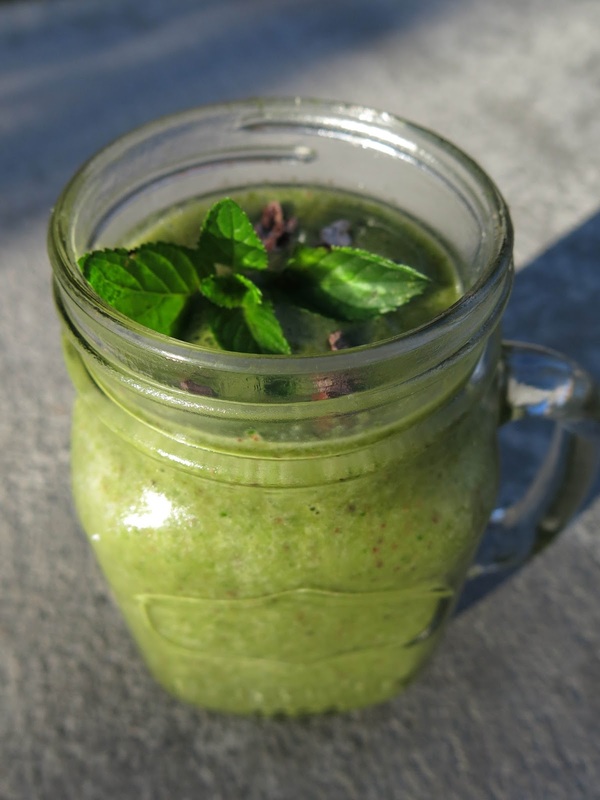 This recipe is adapted from Julie Morris’s Chai smoothie recipe from her beautiful book, Superfood Smoothies. She uses cashews, but I usually skip them in my smoothies, as cashews are a precious commodity in this household. They don’t stick around for long, so I tend to reserve them for my no-bake treats and sweets. The original recipe also calls for coconut water, but almond milk adds a little extra creaminess that reminds me of that coffee-shop chai latte (on ice, of course). Blend all ingredients together in a high speed blender. 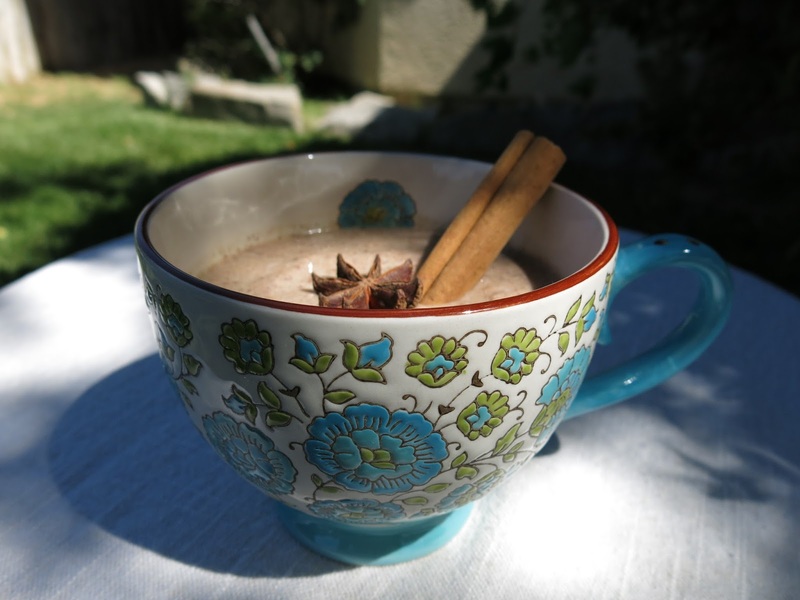 Pour into your favorite morning mug, sit outside in the early morning sun and enjoy the cool comfort of your healthy chai latte! 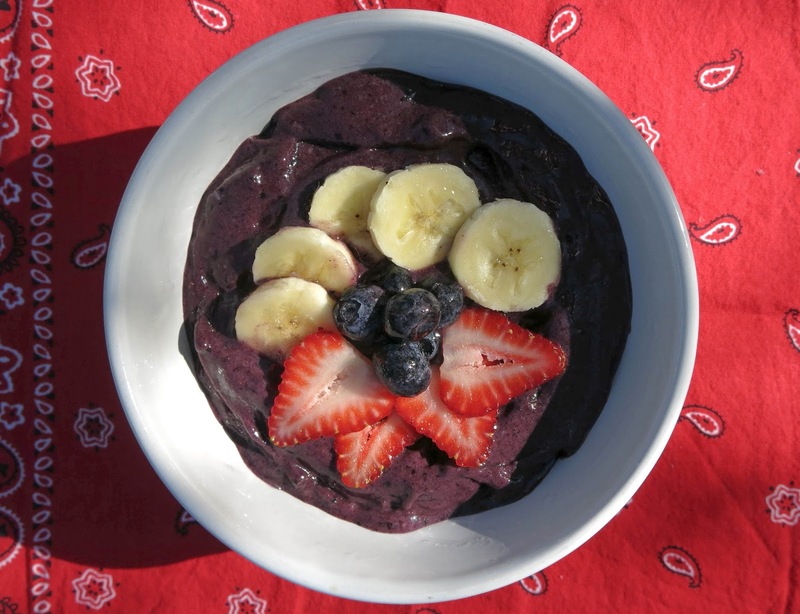 Another way to get a cool start to your day is with a delicious and nutritious acai bowl. 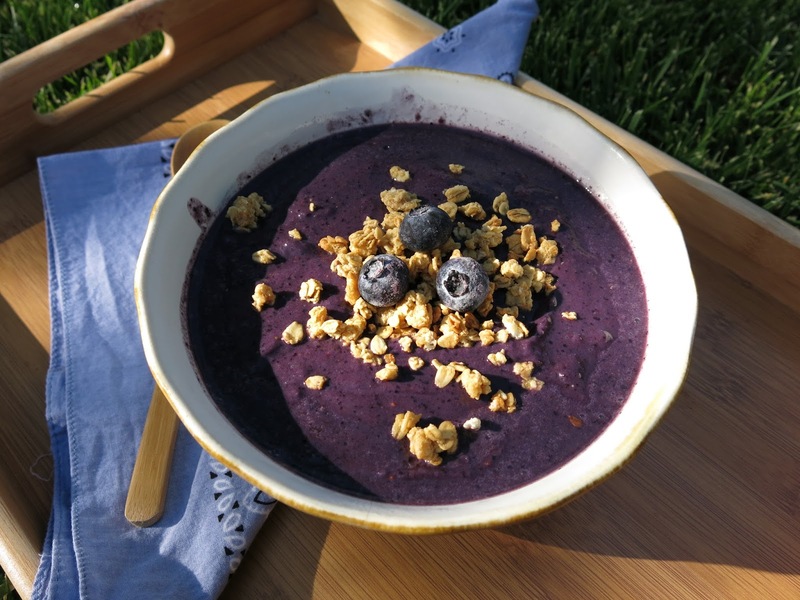 This Brazilian superfood breakfast is made with acai berries, in some form or another. 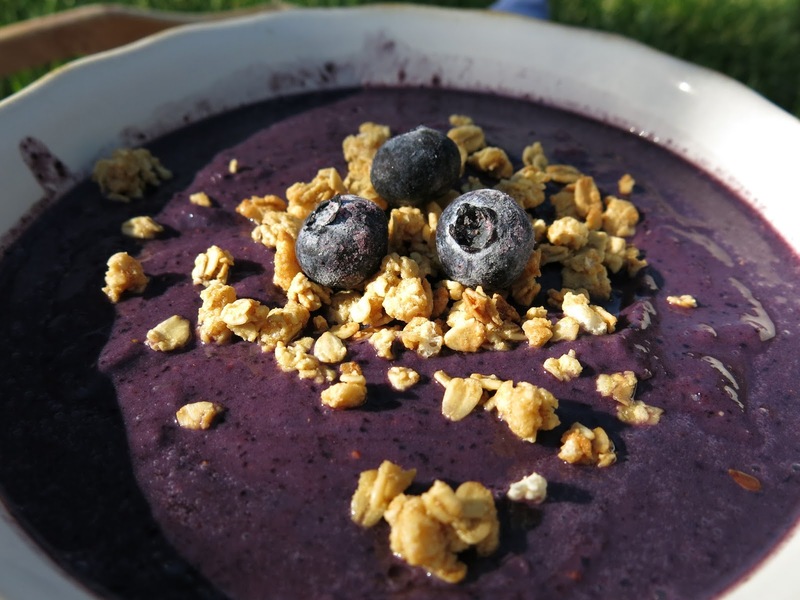 There a multitude of recipes out there for acai bowls, using either frozen concentrate, bottled juice or powder. This beautiful bowl is a variation on my hubby’s favorite recipe, with a few added ingredients. It’s like eating a big bowl of berry-licious ice-cream for breakfast! In a food processor, blend all ingredients until smooth and creamy. Avoid over-processing or you will end up with a runny version. I like mine thick and spoonable. Enjoy your berry bowl plain or add your favorite toppings. I usually toss a few berries on top and a sprinkle of homemade granola. Feeling patriotic this morning, I made the red, white and blue version pictured above, setting the food mood for this fiery 4th of July. I am secretly a lover of ice-cream, especially when I find myself wilting in this summer weather. However, Dairy and I…we just don’t get along. Ben and Jerry are not my friends. I try to avoid dysfunctional relationships in life, but I do still love ice-cream! So, meeting any sweet, chilly, creamy treat that reminds me of this long-lost love of mine, I feel an instant attraction. 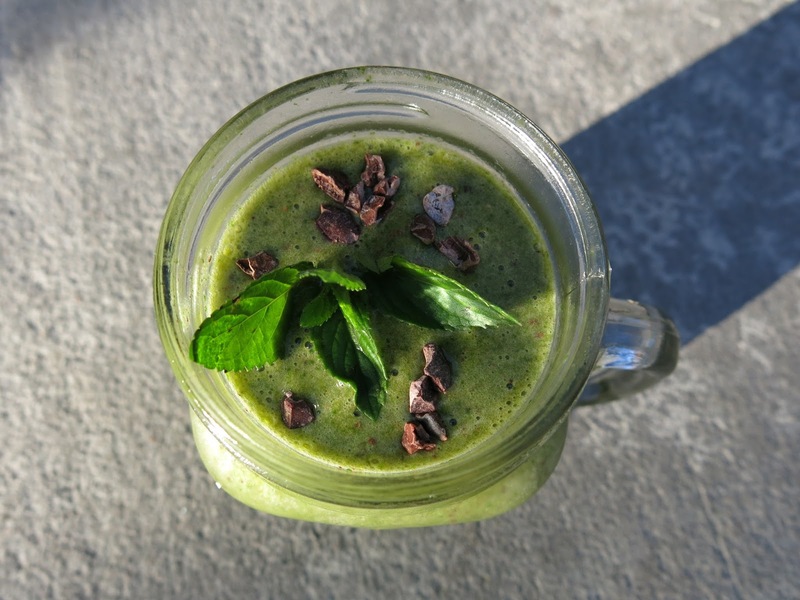 I adore recipes like this Mint Chip Smoothie. With that cool, refreshing flavor of fresh mint and crunchy bits of chocolate…it’s like a trip to the ice-cream shop on a sweltering summer day. Aside from cool, creamy smoothies and such, I am always on the lookout for fun and refreshing ways to stay hydrated in this high desert heat. A simple glass of organic coconut water works wonders for hydration. Light, slightly sweet and very refreshing, coconut water is a good source of naturally balanced electrolytes, giving your body an extra boost in your summer hydration challenge. We really enjoy this bottled organic coconut water, which is usually available in our local grocery stores. But nothing compares to sipping it straight from the source! From time to time I also enjoy my coconut water flavored with fresh fruit and chia seeds. Chia seeds are not only great for staying hydrated, they also provide a source of protein, fiber, minerals (like calcium and iron), antioxidants and omega-3’s. 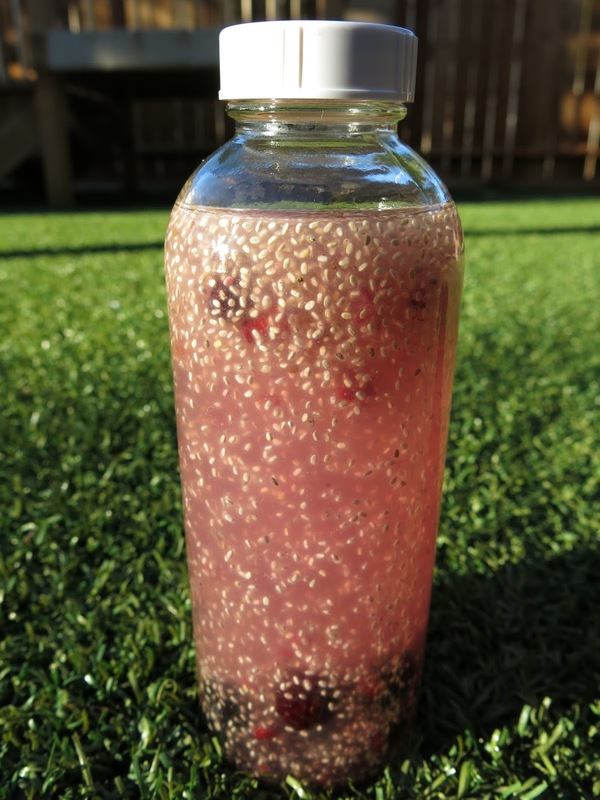 You can buy similar chia drinks in a bottle, but this homemade version is low in sugar, a cinch to make and easy on the budget. Simply add a tablespoon, perhaps a little less or more, to a bottle of coconut water. Shake well and set it in the fridge for 30 minutes or so, while the chia seeds gel up. Then add your favorite fruit (I like simple berries or citrus) to infuse it with flavor. 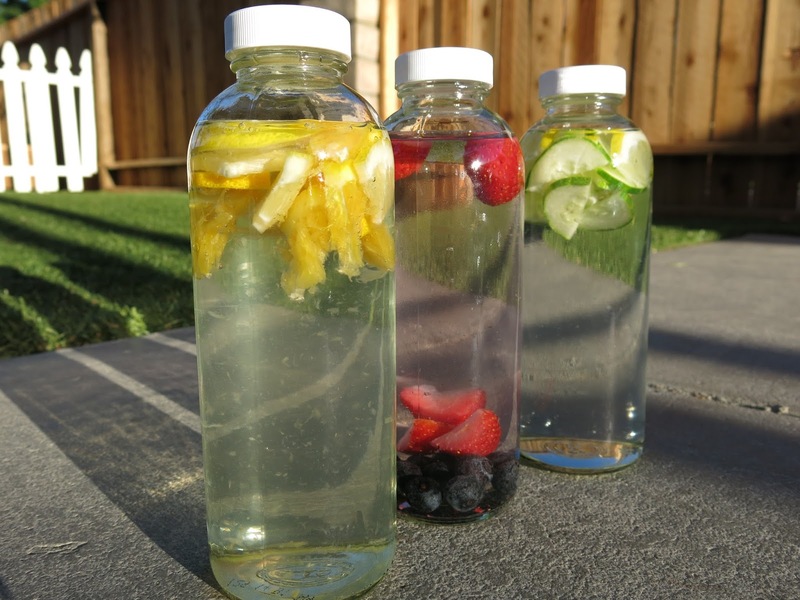 Using fresh fruits, vegetables and herbs is also a great way to infuse your plain old water with fun and refreshing flavor. Try some sunny citrus, mixed berries, cooling cucumber or mint. Get creative, have fun and enjoy! I didn't know you blogged! Nice super foods here. Happy to connect on G+, too.